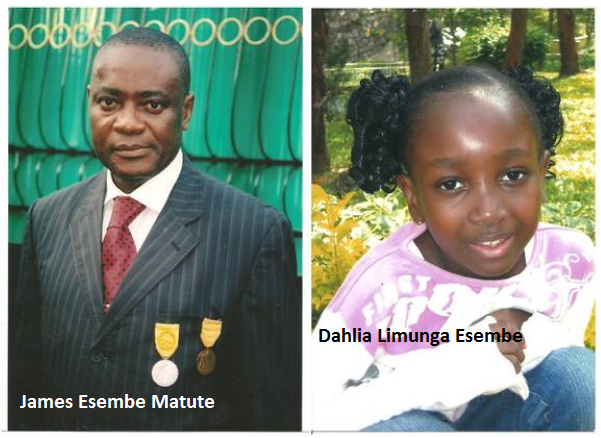 James Esembe Matute and Dahilia Limunga Esembe were laid to rest on 8th March 2012 and December 8th 2012 respectively at Na’anga village, near Wokwaongo (Bokwaongo), Buea. James Esembe Matute was born on August 23rd 1958 at Bokwaongo, Buea. After Primary education, he picked up employment with Mrs Gwendoline Burnley, and also worked with Dr Nasser and later on joined the Cameroon Development Corporation as a driver. Being so devoted, he was selected to serve as driver to Mola Peter Mafany Musonge the then General Manager of CDC, who later became prime minister of Cameroon. He then continued with him at the Prime Minister's Office and at the Grand Chancellery of National Orders and died in active service after successfully driving his boss on that fateful day from Yaounde to Limbe.He was decorated in 2007 with knight of the Cameroon Order of Merit and in June 2012 as Officer of the Cameroon Order of Merit. James was very humble and willing to assist everybody around him.To the two of them we say life at best is very brief like the falling of a leaf, like the binding of our sheaf. They leave behind a host of family members and friends to mourn them. They were a real blessing to all the family.
. Dahlia Limunga Esembe was a former class Four pupil of the Franky Academic Complex , Obili, Yaounde. Sometime in February 2012, she was diagnosed with a heart problem and rushed to the Shisong Catholic Hospital at Banso. She was supposed to undergo an operation end of March but passed on at about 9:00 pm on March 6th 2012.